I’ve actually never had musubi before making it today, but I have had Spam. In fact, I LOVE Spam. I have these Spam memories of my dad frying it for breakfast in the morning. He’d cut up the crispy bit and would serve it with rice. Spam is very (very!) salty, so we often didn’t add any other seasoning. 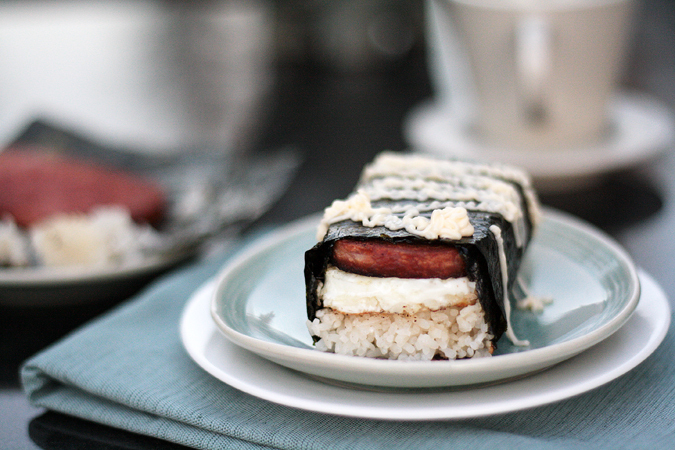 Spam musubi originated in Hawaii, invented by Japanese Americans during World War II. Spam was a meat replacement during that time, as meat was scarce during wartime. I added eggs to this classic to balance the saltiness of the Spam. This recipe yields 8 whoppers, but if you don’t have 7 friends to share with, you can wrap in plastic (sans mayo) and refrigerate the musubi. Reheat in the microwave and top with mayo afterward when you want a snack. It won’t be crispy anymore, but it will still be pretty yummy. Heat up a large nonstick skillet over medium high heat with about 1 tablespoon of oil brushed over the surface. Arrange spam pieces across the pan. Pan-fry for about 5 minutes, until golden brown and crispy. 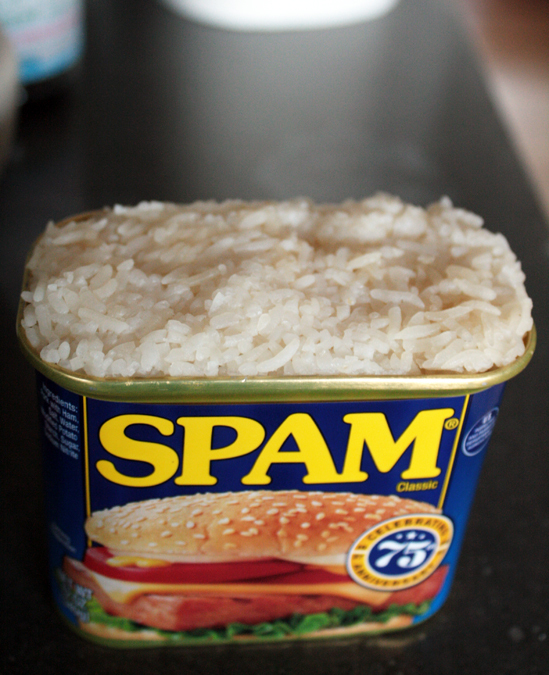 As Spam is cooking, press half of the rice into the Spam can, packing it in tight. Bang out the formed rice, which will come out in a Spam shaped brick. Carefully slice the rice into 4 pieces, washing and wiping the knife clean after each cut. Further press and condense the rice patty with your fingers. Repeat with the rest of the rice. Flip over the Spam pieces and brown the other side, too. Remove Spam pieces from the pan and and allow to cool on a rack. Cut the bottom off of the spam can with scissors (be careful!). Put in another tablespoon of oil in the pan. Turn the heat to medium. Place bottomless Spam can, machine-edge down, on the flat surface of the pan. Carefully crack an egg into the can and press down on the edge of the can with a hand towel (watch the sharp edges!) so no egg escapes from the mold during the initial cooking. After about a minute, the egg should be set enough and you can let go of the can. After 2 minutes, free egg from the can. It should release with a little bit of shaking. Flip the egg over to cook it "over easy." Remove egg from the pan after 30 seconds. Repeat with other 7 eggs. Pour the soy sauce into the mayo and stir to incorporate. 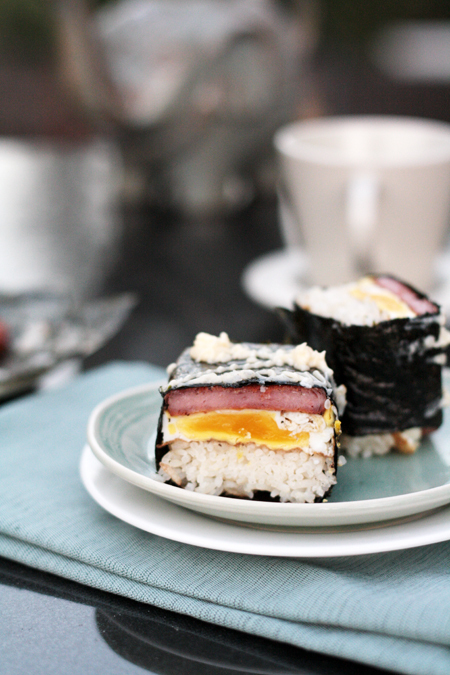 To compose the musubi, lay a piece of fried Spam in the middle of the nori, top it with the egg, then the rice. Fold the flaps of the nori over the rice, using a little bit of water to help the flaps stick together. Flip the musubi over, top with a smear of mayo, and serve! Please, no jokes about Spam because Spam is too awesome for your ridicule! What crazy deliciousness is this?!! Leave it up to the hawaiians to come up with something so genius. This is the first time I heard of musubi, thank you for sharing it, it certainly made my day. You’re welcome! Musubi IS pretty awesome. I get super happy whenever I see people selling it in delis or if it’s on a restaurant menu. Ah, thank you for your kind words, it’s always nice to hear that from someone. You know, reading your post again, I realise that how we have our spam is very similar, usually we would dip them in egg and fry them, the left-over egg would then also be fried, and we’d have them with rice. It must be an asian thing. Years ago when I lived with a bunch of aussies, one of them said, “Why are you frying them? Just eat it out of the can”, which to me is like sacrilege to the highest degree. Dude, I always fry my Spam. It actually never occurred to me to eat it from the can because OF COURSE you want your Spam to be crispy and brown and delicious. Perhaps this is an Asian thing–texture is rather important in Asian foods.